I particularly enjoy teaching adults who tell me that they always wanted to play the harp but felt they were too old to learn..... you are never too old to learn to play the harp! The harp is a wonderful instrument to learn to play, it sounds lovely from the moment you play it - no squeeks or honks to put up with. Yes good co-ordination helps, but it's a fantastic brain-trainer and the co-ordination you need will come with practice. 21st century harp lessons - expert tuition over the internet in the comfort of your home. A harp is a wonderful instrument to play. It's also a wonderful piece of craftsmanship by a skilled harp marker. As such they are not cheap.... and you get what you pay for. Buying a harp should be no different from any other financial investment. Buy the best quality harp that you can afford. A good instrument will give years of enjoyment, and will keep it's re-sale value. A cheap instrument will be poorly made, will not keep it's re-sale value, will probably not have a good tone and be hard to stay in tune. Most importantly if it sounds horrible you won't enjoy playing it. Before you buy a harp, do your research. Check out the company that makes that instrument. See what various shops online sell those harps for, and then check out the second hand forums to see how many are available second hand and what they are retailing for. Also look at how long those harps are on the listings for before they are sold. What you will find is that some harps keep their re-sale value well and some do not. Study the second hand listings and you will get a feel for what harps are selling and what are not! If the harps new retail price was very low, you are unlikely to see them on the second hand market listings that are used by the harp community. Some harps are such sought after instruments that as soon as one comes on the second hand market they are sold almost immediately, so you may not see many (if any) on the second hand market. Look at harpists on YouTube and if you like their sound, see what harp they are playing. If you are not sure what make of harp they are playing, email them and ask! Some shops will do "hire to buy" schemes. These can be very good, but make sure you don't get locked into a scheme just because it's cheap. A scenario I often see is someone being lured by a "hire to buy" scheme which may be cheaper than anyone else's but in the end it costs more because you end up buying an instrument which if you come to re-sell doesn't keep it's value in the long run. If you are going to invest in a harp it's going to be quite an initial outlay, so it's worth buying a better quality harp which will give you years of enjoyment. If you buy a cheaper harp to start with, you are only going to have buy a "better instrument" sooner rather than later. If you buy a second hand harp, you must see it and play it. Ask when it was last serviced and who serviced it. Harps should always be serviced by a recognised harp technician. Ask about the harps history and who has owned it. If it has belonged to a professional harpist they will probably be happy to talk about it's history. Ask whether the soundboard or neck has been replaced. If so ask who repaired it. There will be reputable harp repairers who will do a good job, find out who they are and speak to them. Heres a link worth looking at to see how harps are maintained. Lever harps, although nowhere near as complex as concert harps, still need to be maintained by a professional! A soundboard should not be bowing up and should not have cracks. If the harp is not in tune when you see it, ask the seller to put it in tune before you try it. Only buy from listings or shops that the harp community uses. If professional harpists don't buy from there, you shouldn't either. There are lots of wonderful second hand harps out there waiting to be loved. I would always recommend someone to buy a 34 string harp if at all possible. It has more bass notes and will give you much more flexibility. Factors to consider when choosing a harp. Do you want to get qualifications on the harp and do grade exams? Get a 34 string harp. Do you want to play for fun only? Get a 27 string harp. Do you want to "move up" to a concert harp one day? Get a 34 string harp. Does the harp need to be light and portable for practical reasons? Get a 27 string harp. Do you want to play with other musicians for fun? Get a 27 string harp. Do you want to play with lots of different types of musicians and styles of music? Get a 34 string harp. Do you want the harp for a small child? Depending on their age and your budget, a 27 string harp is ok as a very first harp, but you will need to then buy a 34 string harp if they want to do grade exams. It's perfectly possible for a small child to start on a 34 string harp! ​I'm not associated to any particular brand or manufacturer of harp. My concert harps are Salvi and I play Camac and Starfish lever harps. I've seen and heard lots of different types of harps during my professional career. Each harp is individual and in the end it's all about the sound! 1 A Computer! A PC or Mac is fine, as is a desktop or laptop. 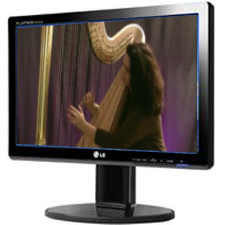 You just need to be able to set-up your computer near to your harp, and use the hardware and software below. If you're lucky, your laptop will have a built-in web cam and microphone. 2 Zoom (which lets us make video calls using a webcam). PLEASE NOTE - Because of issues with quality I now use ZOOM for online teaching rather than Skype or Facetime. Zoom is free and easy to use. I send students a link via email prior to the lesson and all that you need to do is click on the link in the email. 3 A webcam. Minimum recommended specifications: 640x480 pixels (equivalent to 1.3megapixels), 30fps (frames per second) or a video camera which you can plug into your computer with a USB or firewire cable. Some laptops have a built-in web cam. 4 Microphone plugged into your computer with a mini jack. Some laptops have a built-in microphone. 5 Headphones - you must wear headphones as this reduces the possibility of feedback. Small, standard in-ear headphones work just as well as headsets with in-built microphones. 6 A fast broadband Internet connection making sure you have installed the latest version of whatever browser you use. If you do not have a good wifi connection then it is worth connecting your computer directly to your router with a cable. Most wifi connections are ok these days and this only needs to be done in exceptional circumstances of if you live in a particularly bad/low broadband area. Online one-to-one harp lessons. Thanks to the wonders of modern technology, I can provide personal live harp tuition, no matter where you are around the world, via video conferencing using Skype software. A harp - minimum of 27 strings with all levers. A webcam. Minimum recommended specifications: 640x480 pixels (equivalent to 1.3megapixels), 30fps (frames per second) OR a video camera which you can connect to your computer via a USB or Firewire cable. Microphone connected to your computer. If you don't already use Zoom, I suggest that you visit their website https://zoom.us/ and make some video calls to friend and family first. You do NOT need to sign up and pay for a monthly contract. The free version of Zoom works fine for lessons. For our lesson, you'll need to set-up your Webcam and computer so that I can see your entire harp, and hear you! It can take a while getting the right position of camera and microphone, so it's worth spending some time to sort this out. Don't forget to think about lighting levels and also turning off phones and and making sure you won't be distracted by children or pets! You need to set up the camera so that it films you from your left hand side, 45% to your left from the front facing of your harp. The picture you are capturing needs to include all the harp strings, levers, and also your hands, arm and face. Once you have sorted out the position of camera and microphones it's best to do a practice test run with a friend online first so that there is minimal wasted lesson time. For the first lesson I do allow an extra 10 minutes to double check any technical equipment issues. Work out about 4-5 different half hour time slots that are convenient to you in your local time. Choose different dates and times of the day within a week. whether you are an adult, or you are making a lesson request for your child. I'll then email you back and then we can confirm and sort out a time/date. Once we have found a time slot that works well for us both, I like to try and keep to the same time/date if at all possible for further lessons. Please bear in mind though that as a professional gigging musician, I can't guarantee the same time slot each week/fortnight for you, but will try my best to accommodate you. How often should you have lessons? Thats very much a personal decision and depends upon the individual and how much time they have to practice. I'm happy to be guided by what you want out of your lessons and the timescales and goals you want to reach. I have an adult student who started having harp lessons because she wanted to play at her sisters wedding ceremony later that year...... and she did! If you want to gain qualifications I teach students using the ABRSM (Associated Board of the Royal Schools of Music) and they have exam centres world-wide. For children, regularity is best. Because of the demands on children today with lots of school work and extra curricular studies I usually recommend a half hour lesson once a week for children in junior school (up to age 10), and a lesson once a fortnight for children in senior school (11+). For adult beginners, I recommend 30 minute lessons once a week/fortnight to begin with. Once the basics have been sorted out then a 30 minute lesson either once every 3 weeks or once a month. If however you have more time to practice and feel you could benefit from continuing with fortnightly lessons then I'm happy to do so. What is the cancellation policy?coming soon! Lessons are bought via our secure server in blocks of two at a time, with a special discount if you buy them in blocks of 5. Please use my online shop to buy lessons. eg. Buy 5 x half hour = 5 x £20 = £100. And get the sixth lesson free! Ready to buy Lessons and Gift Certificates? You do not need a Paypal account to make a purchase. If you are buying lessons for someone else, please add a note during the Paypal Checkout process.